Easy, cut-and-replace installation lowers the bolt handle on straight bolt rifles without welding or forging. Gives the same bolt life height as the military bent bolt to clear high mounted scopes. Easy-to-grasp, round knob gives fast, smooth cycling. Includes the correct drill and tap, plus complete, easy-to-follow, instructions. SPECS: Steel, in the white. 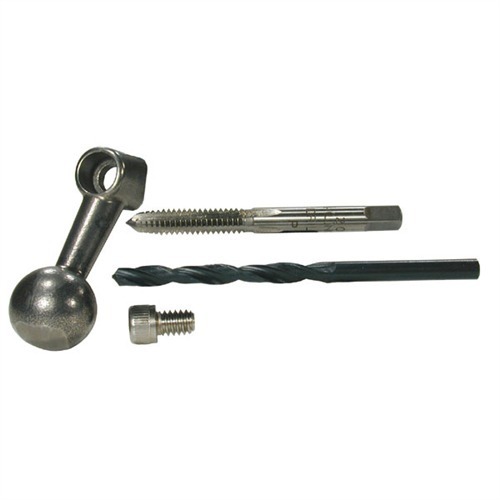 Includes bolt handle, mount screw, drill bit and tap. Lett, klipp-og-erstatt installasjon senker bolten håndtaket på rett bolt rifler uten sveising eller smiing. Gir samme bolt livet høyde som militær bøyd bolten fjerne høy montert omfang. Lett å forstå, runde knappen gir rask, glatt sykling. Inkluderer riktig drill og trykk, samt komplette, lett-å-følge, instruksjoner. Spesifikasjoner: stål, i hvitt. Bolten håndtaket, mount skruen, drill litt og trykk. easy to use, no real technical knowledge needed. I assumed that the completion of this modification would allow use of a scope. It does not; not even compact scope unit. The height of the newly modified bolt from the axis of the bolt to the highest point under the scope when the bolt's opened (which is where the Allen-head hold-down bolt faces) would require scope rings at least 1/4" taller than the tallest available (Burris super-high Signature rings). I can butcher the application and grind it down, including the hold-down bolt, but don't think this is what the manufacturer intended, and it still might not be enough. I'll be calling Brownell's on this one for sure. I spent >> 3h fitting & then fiddling with this one, and now I still have to weld on the "proper" handle. Too bad. Poor design; not enough thought into it! I used it to modify a cheap home sportierized (when I bought it) Chilean Mauser I got for my daughter and was able to use high ring scope mounts to get it to work. Considering that I paid about $150 for the rifle it was a great product. Does not give a true custom look but at least it was functional. Kit should come with smaller starter bits...my experience with hard steel is that starting small ensures better hole-centering. Produsentnr. : MBH1800 758152118004 Lett, klipp-og-erstatt installasjon senker bolten håndtaket på rett bolt rifler uten sveising eller smiing. Gir samme bolt livet høyde som militær bøyd bolten fjerne høy montert omfang. Lett å forstå, runde knappen gir rask, glatt sykling. Inkluderer riktig drill og trykk, samt komplette, lett-å-følge, instruksjoner.